It’s that time of year already -- brands are busy planning their Christmas campaigns. At the most competitive time of the retail calendar, how are you planning to capture consumers’ attention? It’s not too late to integrate show-stopping augmented reality into your Christmas campaign -- that’s where we come in! Augmented reality offers exciting opportunities to make a real impact this season. 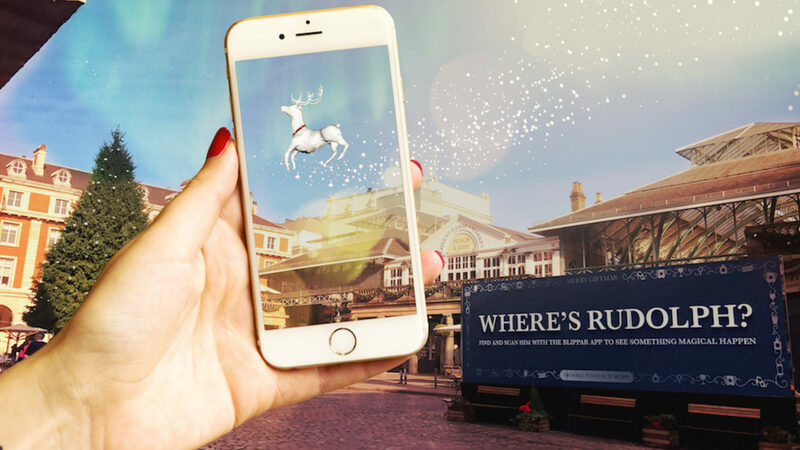 Whether you’re in retail, events or ecommerce, AR can create magical festive experiences to delight consumers and deliver strong results. Read on to meet three festive experiences we can create for you in time for the Christmas period. Enhance indoor and outdoor spaces with festive treasure hunts. Shoppers (or event attendees) can search for interactive clues around your space, then scan them to find Santa’s missing elves, Christmas presents, or any festive mascot in augmented reality. Once they’ve completed the hunt they can claim their treasure i.e enter a prize, unlock a discount code. Or an instant win. This is a brilliant way to drive footfall to your space, encourage purchase with unlockable offers, and create a unique brand experience that leaves a lasting impression. For example, we turned Covent Garden in London into an augmented reality Christmas shopping destination. Shoppers had to hunt for Santa’s missing reindeer by scanning posters on shop fronts and in stores. Once they had found them all, they could enter to win daily prizes. 52% of participants completed the treasure hunt, 30% redeemed an offer, and 24% shared the experience on social. Surprise and entertain consumers this Christmas by letting them build their own AR experience. Consumers simply have to colour in their paper Santa or Elf, and then scan to bring it to life in augmented reality. This is a fun and memorable experience to add to your product packaging or paper collateral -- from catalogues and handouts, to direct mail, corporate greeting cards, and more. 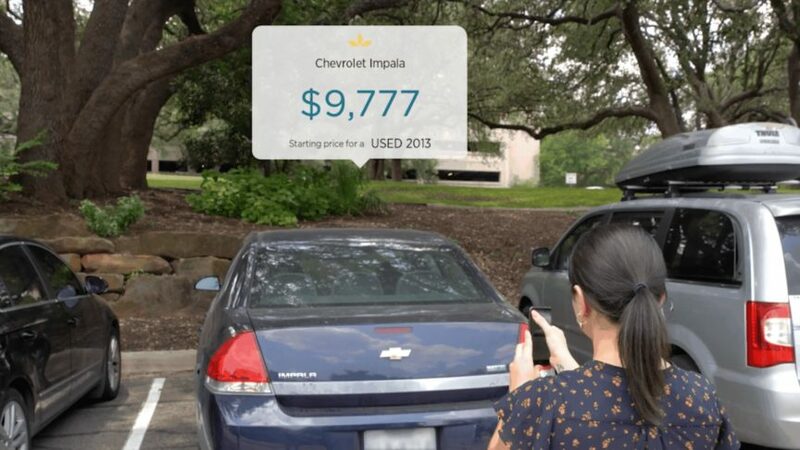 It’s also a powerful way to drive brand engagement, particularly for continuing to engage customers post-purchase as they enjoy their AR experience at home and share it with friends. For example, we created a build-your-own virtual snowman experience. 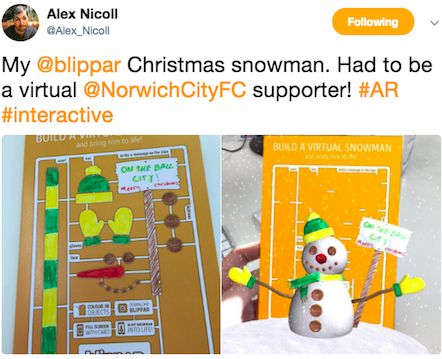 After colouring in the Snowman, recipients could scan the card with the Blippar app to watch him assemble to form a 3D snowman in augmented reality. It was a great hit on social and everyone who received it, loved it! Tap into a hit social media trend this Christmas -- selfie filters! These fun and shareable experiences are a great source of brand engagement and getting people to spread the word of your brand or product. Let consumers take photos and videos in different festive scenes to share with their friends. These experiences can be launched from any touch point, including product packaging, print collateral, physical spaces, and web AR. 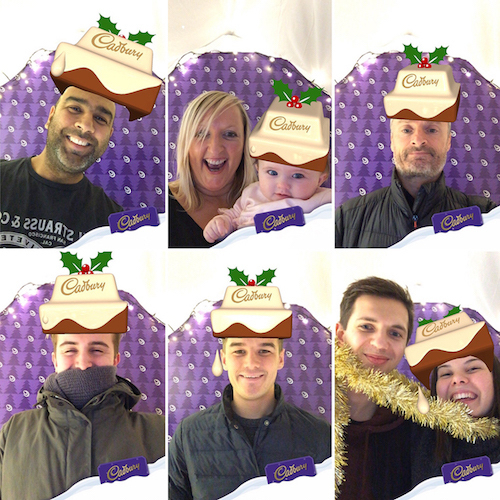 We created an augmented reality Christmas campaign for Cadbury, activating its advent calendar with 24 selfie filters. Customers could unlock a new selfie each day of advent -- from Fudge Christmas jumpers, to elf costumes. The calendar debuted in 2017 as the 4th best selling in the UK. 67% of users scanned the calendar more than once, and the campaign generated 98,000 social shares from 200,000 interactions. These three experiences have a turnaround time of 7 weeks on average, so rest assured AR is still a viable option for your Christmas campaign. But it’s best to get in touch sooner rather than later so there’s plenty of time to plan and refine your ideas. Or if you have a different experience in mind for your Christmas campaign, we can provide an end-to-end service to make it happen -- just drop us a line! Book a call with our team to discuss how you can harness AR this Christmas. Or drop us a note here.